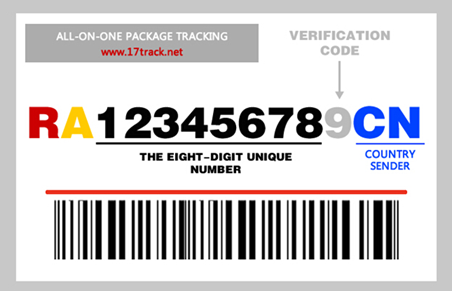 According to the regulated UPU track number (or alphanumeric number bar code identifier postal) consists of 2 letters, 9 numbers (unique number) and two letters of the standard ISO 3166-1 alpha-2 pointing to the parcel sender's country of origin. Please note that the code consists of 8 unique digits + 1 (ninth). The last digit serves as verification code (calculated from the number of departure). Let's look at the example code shown in the figure. The second letter was used to indicate the type of dispatch, for example: by air, sea, w/d, or as an ordinary letter. The last two letters, as stated above, are used to identify the country of the sender. The formats of the tracking numbers of some commercial carriers and private companies do not apply the international standard UPU.